What is BMC Cloud Lifecycle Management? BMC Cloud Lifecycle Management is a system that automates the swift provisioning of multi-tier IT services across cloud and non-cloud platforms. The technology integrates to IT processes such as change management, configuration management database, compliance, and patching to achieve maximum agility while ensuring vital governance and compliance for mission-critical cloud workloads. BMC Cloud Lifecycle Management speeds up innovation and consistent delivery of digital services. The program coordinates, controls, and secures application and infrastructure services across hybrid environments, with integrations to essential IT management processes to avoid risks and cut down on costs. Organizations using BMC Cloud Lifecycle Management attest to faster provisioning of IT services. Automated functionalities also result to cost savings from labor reduction. Security risks are also reduced due to automated cloud governance and compliance. BMC Cloud Lifecycle Management has a self-service portal to help increase productivity throughout a user’s organization. Business users can request configurable services across infrastructure, platforms, and applications even without intervention from IT personnel. An integration with BMC MyIT also allows a single service catalog to be provided for all IT service requests. Users can enjoy full-stack service provisioning as BMC Cloud Lifecycle Management’s advanced blueprint functionalities automate the provisioning, ongoing management, and de-provisioning of an entire business service. This also supports application container technologies to achieve agile development and deployment. 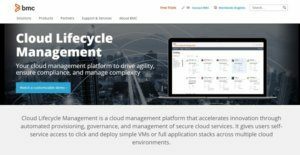 BMC Cloud Lifecycle Management allows automated IT Service Management (ITSM) governance, wherein a built-in integration changes management processes and updates to the configuration management database. This secures ITSM governance throughout a full lifecycle of the cloud service to maintain its quality. Users can maintain continuous compliance as BMC Cloud Lifecycle Management has features to automatically apply policies for regulatory and security compliance requirements. The solution provides continuous automation of patching, configuration management, and remediation. BMC Cloud Lifecycle Management maintains neutrality in delivering services across any platform, based on targeted workload requirements. This feature supports a wide range of infrastructures and public clouds, thus allowing users to maintain flexibility and avoid vendor lock-in. Service health management features allow BMC Cloud Lifecycle Management to easily monitor service health through an intuitive dashboard. The platform is fully scaleable according to pre-defined service requirements. Users can also avoid service disruptions with the help of proactive and actionable failure notifications and recommended remediation procedures. This ensures the quality of services provided by the user’s organization. If you are interested in BMC Cloud Lifecycle Management it could also be beneficial to analyze other subcategories of Best Cloud Management Software collected in our base of SaaS software reviews. There are popular and widely used applications in each software category. But are they essentially the best fit for your organization’s special needs? A market-leading software product may have thousands of customers, but does it offer what you require? For this reason, do not blindly shell out for popular systems. Read at least a few BMC Cloud Lifecycle Management reviews and consider the elements that you wish to have in the software such as the price, main functionality, available integrations etc. Then, shortlist a few apps that fit your needs. Check out the free trials of these apps, read online comments, get explanations from the maker, and do your research thoroughly. This profound homework is sure to assist you find the best software application for your company’s unique requirements. How Much Does BMC Cloud Lifecycle Management Cost? Information on BMC Cloud Lifecycle Management’s enterprise pricing plans are not available. Interested buyers may contact a sales representative via the product’s official website. We realize that when you make a decision to buy Cloud Management Software it’s important not only to see how experts evaluate it in their reviews, but also to find out if the real people and companies that buy it are actually satisfied with the product. That’s why we’ve created our behavior-based Customer Satisfaction Algorithm™ that gathers customer reviews, comments and BMC Cloud Lifecycle Management reviews across a wide range of social media sites. The data is then presented in an easy to digest form showing how many people had positive and negative experience with BMC Cloud Lifecycle Management. With that information at hand you should be equipped to make an informed buying decision that you won’t regret. What are BMC Cloud Lifecycle Management pricing details? What integrations are available for BMC Cloud Lifecycle Management? There is no information available about the specific third-party applications that integrate with BMC Cloud Lifecycle Management software. If you need more information about BMC Cloud Lifecycle Management or you simply have a question let us know what you need and we’ll forward your request directly to the vendor.